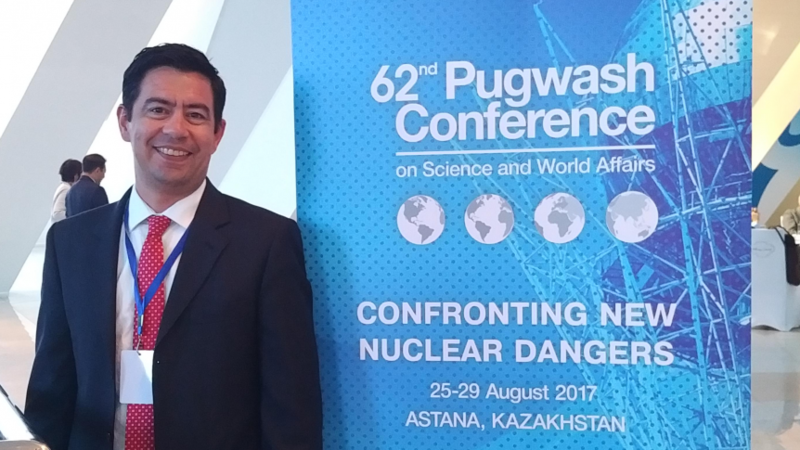 From August 25-29, international security experts from more than 45 countries convened in Astana, Kazakhstan, for the Pugwash Conference on Science and World Affairs. Under the theme “Confronting New Nuclear Dangers,” the conference reflected on some of the most pressing challenges to global security. The event in Astana marked the 60th anniversary of the first Pugwash Conference, held in the small Canadian fishing village of Pugwash, Nova Scotia. Two years earlier, the Russell-Einstein manifesto had been issued by prominent British social activist and Nobel laureate Bertrand Russell, and signed by 11 leading scientists, including Albert Einstein. Pointing to the grave dangers of nuclear war and the need for peaceful solutions to international conflict, it called for a response by a conference of scientists. Canadian industrialist Cyrus Eaton offered to finance that first conference. The venue was a small house—eventually known as Thinkers Lodge—in Pugwash, the town of Eaton’s birth. That conference was attended by 22 scientists from the United States, the Soviet Union, the United Kingdom, Japan, Canada, Australia, China, Austria, France, and Poland. From it evolved an international movement, which has not only provided measured analysis on major security crises, but has helped to open up avenues for communication when traditional channels were blocked. The Nobel Committee awarded the 1995 Nobel Peace Prize to the Pugwash Conference and its first secretary-general, Joseph Rotblat. Today, Pugwash has international offices in Rome, London, Geneva, and Washington, DC. There are approximately 50 national groups, including the Canadian Pugwash Group, which held its own conference last July in Halifax. Multiple global security flashpoints were examined at the Astana conference. Included were the following. The July 7 adoption of the Treaty on the Prohibition of Nuclear Weapons was a key focus of discussions. Widely believed to have dramatically altered the multilateral nuclear disarmament landscape, the ban treaty has caused a deep division between the majority of states, which have no nuclear weapons and strongly support the treaty, and nuclear-armed states and their allies, which have openly sought to undermine it. In Astana, the president of the conference that negotiated the treaty, Costa Rican Ambassador Elayne Whyte Gomez, described the two related, yet different, dimensions to the goal of nuclear abolition—one related to the normative framework and the other to the actual measures to eliminate existing arsenals. The ban treaty, in her view, was an important effort to advance the first. As one Pugwash participant noted, the ink on the ban treaty is barely dry. But it seems clear that the humanitarian movement, which served as a key catalyst of the negotiation of the ban, and the widespread frustration over the lack of progress toward nuclear disarmament by states with nuclear weapons will help to sustain the treaty’s political momentum. The two North Korean missile tests conducted while the Pugwash conference was taking place were the latest in a series of escalating rhetoric and actions that have prompted international condemnation, elicited inflammatory—if often contradictory—responses from the Trump administration, and stoked serious concerns among security specialists and the general public. There was general agreement at the Pugwash conference on the seriousness of the current situation and on the dire consequences for the region and the world should armed conflict develop. As one expert said, even if North Korea does not fire a nuclear weapon on Seoul, it has enough artillery aimed at the South Korean capital to inflict that level of damage. And it is widely believed that North Korea’s nuclear weapons program, including far-reaching delivery vehicles, is advancing rapidly. There was no consensus on the exact measures required to defuse this crisis. But the number of options available to the international community is limited. The outcome document from the 2010 NPT Review Conference contained the decision to convene a Middle East regional conference by 2012 to develop a zone free of nuclear weapons and other weapons of mass destruction (WMD). That conference has never been held. The draft outcome document of the 2015 NPT Review Conference called for UN Secretary-General Ban Ki-moon to convene a Mideast conference by March 2016. But the document was never adopted. The United States, the United Kingdom, and Canada blocked the required consensus, over concerns by Israel (not a state party to the NPT) related to the timeline for the conference. The next opportunity to address this topic will come at the 2020 NPT Review Conference. Kazakhstan has been active in various areas of nuclear disarmament. A former member of the Soviet Union, it voluntarily gave up nuclear weapons on its territory. More recently, it has been a strong supporter of the nuclear weapons ban treaty. But for Kazakhstan, nuclear testing is at the heart of its commitment to pursue a nuclear-weapons-free world. Between 1949 and 1989, the Semipalatinsk nuclear test site in northeast Kazakhstan was the primary testing grounds for Soviet nuclear weapons. During that time, the Soviet Union conducted 456 nuclear detonations. The long-term health and environmental effects only started to be understood after the site closed in 1991. Radioactive fallout has caused mutations and other birth defects for generations of victims. The Kazakh government has made drawing attention to the perils of nuclear testing a national priority. It is pushing for the prompt entry into force of the CTBT, which has not been ratified by eight states (China, Egypt, India, Iran, Israel, North Korea, Pakistan, and the United States) more than 20 years after its adoption. The spirit of the first Pugwash conference was very much alive this past August, as scientists, scholars, diplomats, and civil society representatives grappled with these and other complex concerns. The scientific approach that informed and inspired the Russell-Einstein manifesto still underpins contemporary evidence-based discussions. Arguments—however diverse—are assessed solely on their merits and not on national or ideological affiliation. The core Pugwash conviction is that conflict can and should be addressed through dialogue and mutual understanding. But an openness to diversity and the encouragement of a scientific approach does not obscure a shared and profound concern about the destructive nature of war, especially wars involving weapons of mass destruction. The most quoted line in the Russell-Einstein manifesto provides a succinct rationale to the work of the Pugwash movement: “Remember your humanity, and forget the rest.” At Project Ploughshares, we can fully relate to this humanitarian spirit, which has long been a core foundation for our work.